To Receive all the tools necessary for novice to intermediate level of practice. To understand the essential meaning of Realm of Chod. Benefits of Chod for self & others. To acquire essential meditation and ritual skills to begin regular Cho practice. NOTE: Even in this initial training, most of the information is wholly unknown to 90% of people that practice Chod in any lineage today, as it comes directly from previously untranslated sources. Comprehensive details about the meaning, use and fabrication of damaru, kangling and bell. Descriptions and insight in the four classes of guests, elucidating the real nature of Yidams, Protectors, Dakinis and so on. Comprehensive details about the specific offerings for each type of guest. Introduction to Cho’s unique approach to the body, to the environment (Nyensa), obstacles, generosity, etc. Authorization for any Vajrayana practice requires an empowerment, reading transmission and teaching (Tib: wong, lung and tri). The Cho dempowerment or wong takes the form of a single ritual, the Opening of the Sky Door (Tib: nam kha go gye). Coming from the lineage of Padampa Sangye and MaChik, there are a number of closely related versions, but all open the gateway to any and all Chod practices. 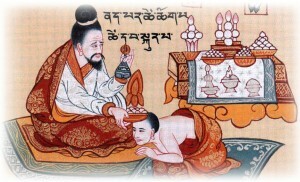 Some traditions offer additional MaChik blessing empowerments (the Do Kyentse lineage) or Troma dakini empowerment (both Dudjom Lingpa and Gelugpa traditions), but these relate to associated yidam practices rather than Chod per se. While a Chod empowerment should be obtained eventually, one can certainly begin practice with a pure heart before this is obtained. Additionally, we new provide a full translation of the Chod empowerment directly from the MaChik tradition, so that the the process of the empowerment is fully understood. This popular short prayer to the lineages of Chod (the PaGyu prayer) is used by Kagyu and Nyingma practitioners as a preliminary to a variety of sadhanas. Written by the illustrious Rangjung Dorje (1284-1339), the Third Karmapa, this realized master firmly established Chod within the Kagyu lineages, preserving and collating MaChiks existing corpus of work. Though brief, recitation of this prayer or SolDeb opens the conduit to the remarkable blessing stream of the enlightened stream of Chod masters, including MaChik herself. Further it sets the stage for practice with aspirations for realization on this very seat. This wonderful daily prayer presents the quintessence of Mahamudra and Dzokchen. This liturgy begins with a guru yoga, which evokes the certain blessing of the Sole Mother, dakini MaChik Labdron. It then proceeds with extremely pithy and profound instructions that cover the entire spectrum of the path, from impermanence to Yidam practice, and from of pointing out the nature of mind, to subtle aspects of luminosity and view. The text is an original composition of the great scholar and mahasiddhi, Karma Chagmé (1613-1678). He collected the twenty-two essential practices of MaChik (collated earlier by Rangjung Dorjé) into the Precious Rosary group of texts (Rinpoche Tsogley Trengwa). Lama Jinpa’s transliteration and translation are in a style that favors the poetic and evocative nature of this profound sadhana. Jigmé Lingpa (1729-1798) was an extraordinary terton, whose collection of revealed treasures, the Longchen Nyingtik (Heart Essence of Longchenpa) had a profound and lasting effect on the whole of Tibetan Buddhism, especially the Nyingma tradition. Though he wrote only one full Chod practice, this ritual (Laughter of the Dakinis or Khandro Gejang) become the dominant Chod of the Nyingma, as well as many Kagyu lamas, right up to the present day. However, a second, very condensed and handy Chod practice is found within his Preliminary Practices or Ngondro. The Kusali Tsok has also become very popular, as it contains all elements of Chod, can be accomplished rapidly, and is a perfect vehicle for inserting other healing or specialized practices. It is short enough to be memorized easily and becomes a staple in the compassionate armamentarium of the Chopa. Enlightenment on One Seat is an essential practice for anyone entering the door of Chod. Written by Padamapa Sangye himself, it is the only Yidam practice featuring MaChik, blue in color and with the wrathful attributes of Vajrayogini. Using a three-fold visualization (self, front and skullcup/mirror) it brings down the powerful blessings of the entire Chod lineage. The core of the practice is the MaChik mantra, while the conclusion has a unique lineage blessing with different deities in each of our chakras. There is a special shrine set-up, including a skullcup and the practice can be done on a retreat basis or daily ritual to accumulate the required number of mantras. This exquisite MaChik practice is known to all Kagyu and Nyingma Chod practitioners, but has previously not been taught in the West. The accurate translation allows one to perform this in English is so required, so receive the direct blessings of MaChik, just as she promises in the liturgy. There are six special prayers that are also transmitted in Module 1. The Confession Prayer of MaChik is an ideal daily practice that helps with our ongoing mental purification and clarity, as well as drawing in the blessing stream of MaChik and the lineage of Chod. The melody is particularly beautiful and haunting. The Prayers to the Four Gates of the Reliquary. These four short sadhandas, two composed by the sons of MaChik, are exquisite guru yoga practices, as well as containing pith dharma instructions and mind transmissions. The Exhortation of the 100,000 Dakinis is a brief and powerful tune for bringing in the blessings of the Divine Feminine Wisdom Energy the Dakini Principle, written by Machik herself. May be paid by PayPal, check or in installments (see application, schedule and catalog for download above!). This is the minimum prerequisite for Module 2, Module 5, Bardo Cho and all advanced training. May the lineage of MaChik and her successors continue to shower vast benefit on beings limitless as space!